So Sun-Lord Chris, Robert the Reaver, and Anthony of the Straits recently launched the Slumbering Ursine Dunes Kickstarter. I've helped out a tiny bit in manuscript edits and playtesting. In the traditional post-game bull sessions, the topic of the Zone (and its suitability for a pointcrawl treatment) has come up a few times. And I start to think that fully fleshing out the Zone should be my next game design task. Naturally my inspiration seizes upon something completely different. In this case, it's communications, networks, spies...intrigue. Sanctuary and the local environs are out on the borders of the Asbari Caliphate, certainly. but this does not mean that it's immune from the intrigues that continue to plauge the land. The Calipha assumed the throne ten years ago under suspicious circumstances during the Forsaken War, and the fallout from that transition has not yet been resolved. The Black Banner opposes the Calipha and her reformist agenda. They suggest that she was responsible for her father's death, and support raising up one of the cadet branches of the family to take the throne in her stead. Mostly composed of old money and older nobles, they don't have too much of a presence in Sanctuary. Jamsheyd "Prune-Face" Rabbani, a major cattle rancher, is their most prominent supporter in the region. The Spears of Djaida come from a militia raised to defend Sanctuary during the Forsaken War. They strongly support the Calipha for ending the war, and seek to ensure that her reformist ideals are implemented within Sanctuary. They are quite vocal, but perhaps the smallest of the factions within the city (albeit composed mostly of battle-tested veterans). Serit Axe-Hand, a former sergeant, is the most outspoken member of the Spears; she can usually be found leading street demonstrations protesting the latest outrages by the Governor's personal guard. Since well before the Forsaken War, there has been a growing sentiment that Sanctuary and the western portions of the Caliphate should break free and declare independence. The most recent incarnation of this feeling, Sahabi al-Chai, maintains a vibrant though fractious street presence, and has the readiest access to street toughs and demagogues. Governor al-Hakam has been playing to the Sahabi recently. Boubakar the Tall, known to be punctilious about his truthfulness, leads the Sahabi, and is well respected by all - though perhaps others of the Sahabi less so. The Sons of Marwan are perhaps the most overt of the various factions within Sanctuary, and operate under the thinnest veil of secrecy. 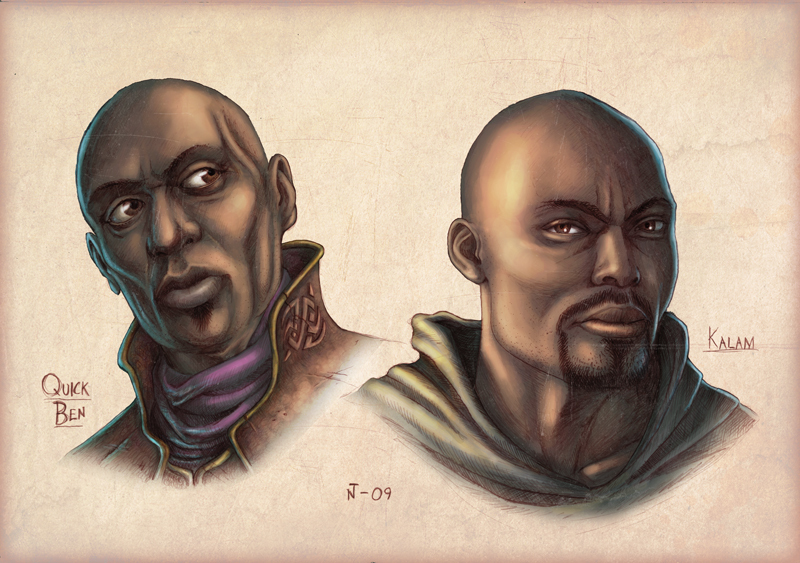 Headed by the sage Zouman ibn Zouman, they represent the alchemists, geometers, and wizards of the city. Zouman, the fourth in his family to bear the group's leadership, has been facing pushback on the name from Hafiza bint Noora and the Whisper, female alchemists angered over the name and the institutional hesitancy towards women practitioners. The official representatives of the Asbari Caliphate are of course the Governor, Mustafa al-Hakam, and the Qadi (judge) of Sanctuary, Lord Abazu the Unsmiling. Governor al-Hakam is but recently arrived from the Calipha's court and is a relative unknown to the people of Sanctuary, but Lord Abazu is very much an institution of the city. His unbending will has recently seen the destruction of the street gang known as the Red-Eyes. While Lord Abazu is seen to be apolitical and above the fray, Governor al-Hakam has had no choice but to enter the political realm. His support from the capital has thinned (particularly as reports of his contacts with the Sahabi al-Chai have filtered back to the court), but popular support has swelled after the recent liberation of the Tower of Horns. The many cultures of Seven Cities seethed with symbols, a secret pictographic language of oblique references that carried portentous weight among the natives. Such symbols formed a complex dialogue that no Malazan could understand. Slowly, during his many months resident here, Duiker had come to realize the danger behind their ignorance. As the Year of Dryjhna approached, such symbols blossomed in chaotic profusion, every wall ine very city a scroll of secret code. Wind, sun and rain assured impermanence, wiping clean the slate in readiness for the next exchange. And of course, all of this is going to produce lots of spiders.